Shaft Seals | Exalto Emirates LLC. Replacement Tides Marine nitrile lip seals complete with a 316 stainless steel garter spring are the only approved parts for fitting to Tides Marine Strong Seal or SureSeal units.When ordering, please provide the shaft seal serial number along with the part number on the face of the lip seal. Please see the&nbsp; able below for full details. Note: The part numbers mentioned are for standard sizes of Tides Marine Seals. 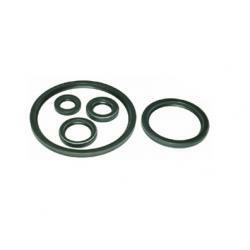 Replacement Tides Marine nitrile lip seals complete with a 316 stainless steel garter spring are the only approved parts for fitting to Tides Marine Strong Seal or SureSeal units. When ordering, please provide the shaft seal serial number along with the part number on the face of the lip seal. Please see the table below for full details. Designed for use on smaller vessels with stainless steel propeller shafts, the seriesOne TM shaft seal is designed to fit shaft diameters from 3/4&rdquo;&nbsp;through 1-1&frasl;4&rdquo;, in 1&frasl;8&rdquo; increments. It is also available to fit metric shafting diameters of 22 mm, 25 mm and 30 mm. 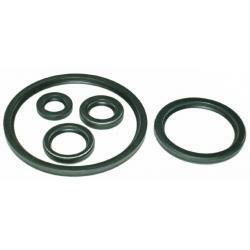 The seriesOneTM shaft seal is to be used in single-engine vessels only. For twin engine applications, the SureSeal is recommended. Key design features of the seriesOneTM shaft seal include: Housing: The one-piece body is manufactured from an engineering-grade thermoplastic.Bearing: The bearing is machined to precise tolerances providing reliable, long-term operating life.Hose:&nbsp;Several hose alternatives are available to optimize operating characteristics of these units. For vessels (like ski boats) with short shafts&nbsp;(length = approx 3&rsquo;), high rpm (range 5000) and rigid engine mounts, a hose with a single convolution is recommended. For work boats powered&nbsp;by smaller diesel engines and softer engine mounts, the multi-convolution hose is recommended to compensate for more lateral shaft movement&nbsp;during operation.Hose clamps: Four standard hose clamps are provided with these shaft seals. If your vessel is operating in extremely harsh environments, 316&nbsp;stainless AWAB hose clamps are available at an additvional charge as an upgrade. Seal replacement:The seriesOne TM is designed to be removed and replaced when the workable life span of the seal has been achieved. 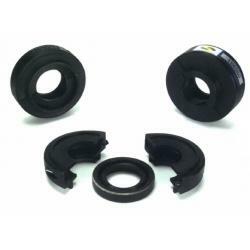 If in-water replacement is a&nbsp;desired option please use the SureSeal line of self-aligning shaft seals. 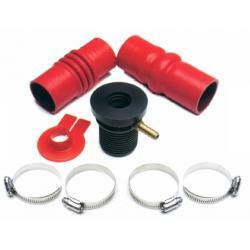 Spare seal carrier kits containing replacement lip seals are only available for&nbsp;SureSeal units. seriesOne&trade; standard sizesThe shaft / sterntube diameter combinations normally available from stock are listed. 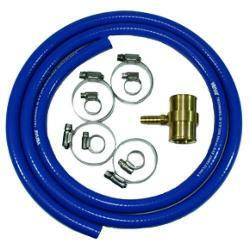 There are two types of kits available: &ldquo;Tee Kits&rdquo;, which are used&nbsp;to tap into the flexible cooling hoses, and &ldquo;Fitting Kits&rdquo;, which are&nbsp;used to tap into fixed points in the raw cooling system. Tee kits:Brass tees are designed to fit a wide range of hose sizes&nbsp;and have branch fittings matched to those found on each SureSeal. 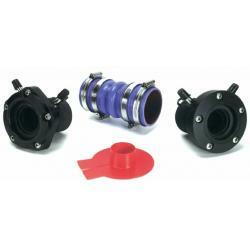 The Tides Marine spare seal carrier kit provides a convenient way of storing a replacement lip seal on the propeller shaft during installation of the SureSeal. 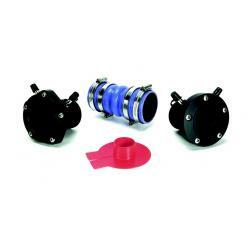 This allows the change of a damaged or worn lip seal without uncoupling the shaft from the transmission. If necessary, the lip seal can be replaced with the craft afloat. The spare seal carrier is a two-piece, non-metallic housing, which is clamped to the propeller shaft in front of the seal head. Carriers up to 1.75&rdquo; / 45 mm contain a single lip seal, whilst carriers 2&rdquo; / 50 mm and above are supplied with two lip seals. Note: The part numbers mentioned are for standard sizes of Tides Marine Seals.